We are excited to announce that the second annual WCS lecture will take place on Thursday, February 25th at 4:00 pm in Bagley 154. 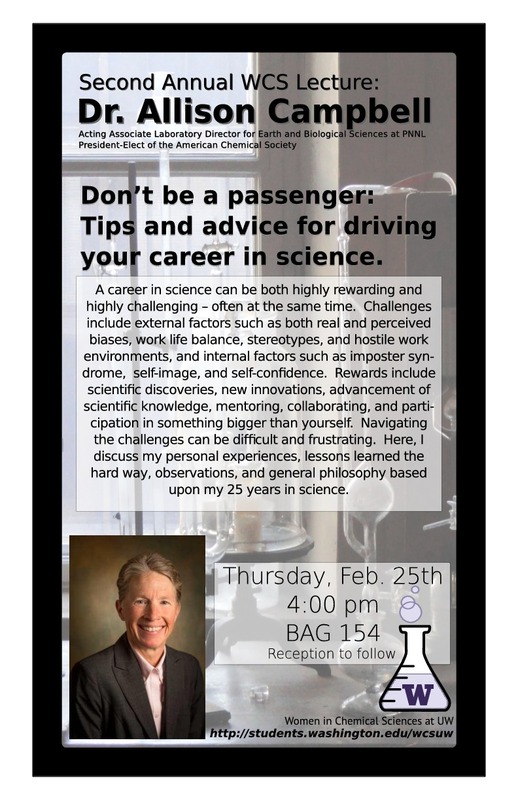 This year’s speaker is Dr. Allison Campbell, Acting Associate Laboratory Director for Earth and Biological Sciences at PNNL and president-elect of the American Chemical Society. Her talk is entitled “Don’t be a passenger: Tips and advice for driving your career in science”; the abstract is below. The WCS lecture series goes beyond chemistry at UW to highlight inspirational women in STEM and their accomplishments and experiences. You can read about the inaugural WCS lecture, featuring Harvey Mudd President and Microsoft board member Dr. Maria Klawe, on our blog here. WCS members will also have the opportunity to attend an informal Q&A session with Dr. Campbell before her lecture. Stay tuned to the WCS mailing list for more details! This entry was posted in Events, Speakers on February 9, 2016 by Heidi.